Past the array of simulcast screens with hypnotized leather-skinned regulars clutching bettor’s tickets like Blackjack hands, and beyond the families seated on long, wooden benches exchanging crumpled dollars for informal wagers, were the chariots. They were enameled and gleaming in candy apple red, cobalt blue and, pearl white. Beyond them were the tiny, darting heads of the ostriches that will pull them to glory. 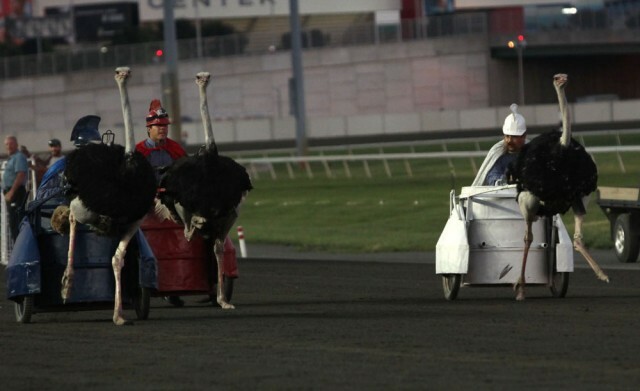 The Cameltonian and Ostrich Derby is a Meadowlands Racetrack innovation, squeezed in between a few of the night’s regular horse races in the hopes of attracting spectators beyond the usual racetrack diehards. The camels and ostriches come from Hedrick’s Exotic Animal Farm in Nickerson, Kansas, a purveyor of dozens of game animals from Africa, Asia and other climates. It doubles as a bed and breakfast. Camels made their way to the United States by way of traveling menageries in the early eighteenth century, but were first used in earnest in the Seminole Wars of Florida in the early nineteenth century. George H. Crosman, a career quartermaster and veteran of the Florida wars, so strongly praised their utility that he developed a U.S. Camel Corps to transport munitions and soldiers across the deserts of the American Southwest. Military use of camels effectively ended in 1861, however, after a Confederate attack on Camp Verde, Texas, where many of the camels were stationed. 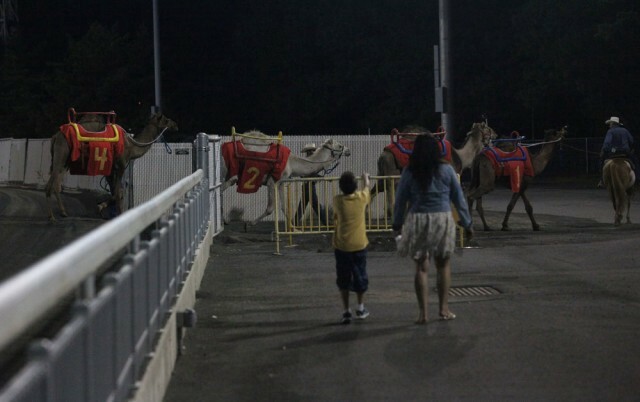 Confused with what to do with the animals — commanders used them to give Camel rides to local children — most were sent away for auction. They were bought by zoos and sold to other private owners, ending up as exotic entertainment as the advent of the transcontinental railroad alleviated the difficulty of long-distance cargo shipping. In 1992, modern camel racing became standardized, when the United Arab Emirates, a historically major exponent of camel racing, established the Camel Racing Association that dictated the rules and competitive practices for the sport across the peninsula. The history of ostriches in the U.S. is of a more recent vintage: They first became a fixture in American livestock in response to demand for the birds’ feathers by fashionable women slightly before the turn of the twentieth century. The plumage was a status symbol, although not a new one, as Egypt’s Olympian equestrian racing Queen Arsinoe II (her tomb also contained a statue of her riding an ostrich) decorated her crown with them, a symbol copied extensively by successive rulers. Florida became one of the first states to host the animals, in the late eighteen eighties, with several farms producing feathers for decorations in women’s hats, as well as feather boas, stoles and fans. But before long, ostrich-feather demand cratered. In 1920, Popular Science reported on the phenomenon of tourists racing ostriches for fifty cents apiece at one Florida farm, boasting that the birds could “easily beat a horse in a long-distance race.” The sport never really caught on nationally, though it did become one of Florida’s earliest claims to fame. 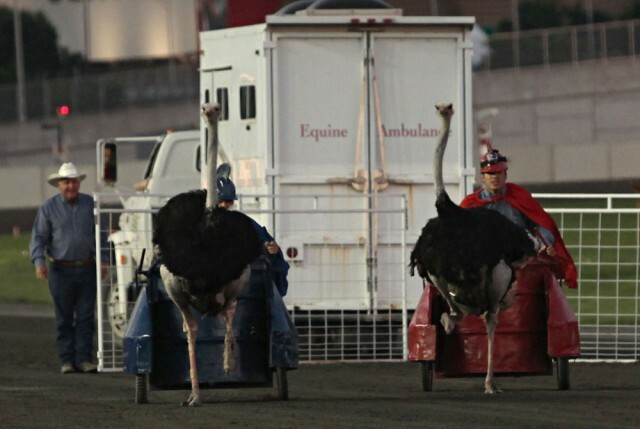 Down at the track’s opening stretch, a truck pulled up, filled with ostriches and their handlers. The tailgate dropped and three men, clad in Roman-style plumed helmets and color-coordinated capes, sprinted out to ready their chariots. As the birds were led to the track, they stomped their feet, sputtered, and resisted any attempt to mold them into a straight line. After the handlers successfully managed to swing the birds around to attach them to their vehicles, another handler, a few hundred feet away, yelled, “When the birds start comin’, hold the nets up real high!” White plastic industrial netting was unspooled and lined up along the track’s finish line. 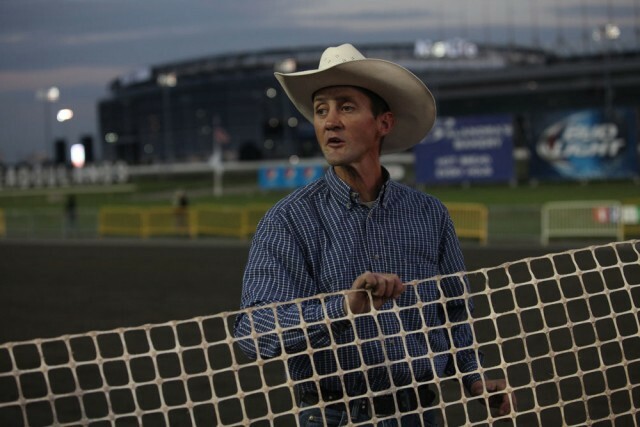 Without fanfare from the announcer’s booth or much of a signal from the track, the birds snapped to attention and took their first frenzied strides; the starting gate truck driver floored it to escape the charging birds. The pack — consisting of Featherduster, Featherbrain, and Skeezix’s Big Bird, according to the day’s program — made a beeline for the netting stretched out in front of them, their riders crouched and coiled in anticipation of erratic ostrich behavior. But the birds ran in an admirably straight line. The chariots kicked up small dust clouds behind them, picking up speed backed by a crescendo of cheers. As abruptly as the race began, it was over. Just as the avian racers began to hit their stride, and the crowd’s excitement peaked, the riders cut the ostriches loose in unison, their quick-release cables falling from the harnesses. The carts skidded to a stop as the ranchers holding the netting began to box the birds in. The birds filed back into the truck, and a race that may not have lasted more than ten seconds was over. “Skeezix’s Big Bird!” boomed the announcer, declaring the winner. Fans stunned by the relative anticlimax — the time it took for the birds to line up and stop fidgeting surpassed the entire duration of the race — turned to each other, comparing notes on what they witnessed. Afterward, the crowd continued to grow in size through the four horse races leading up to the Cameltonian. “It brings the kids out, and us old folks can bet on a race or two,” said Harry, a grandfather dressed in a lavender shirt and pleated khaki shorts, who was watching the races with his grandchildren. 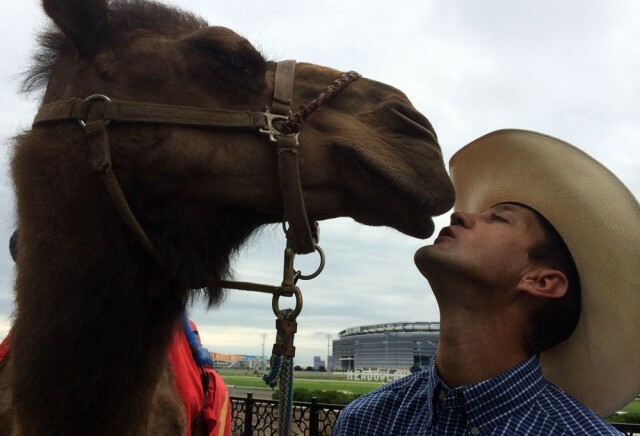 “I bet this place’ll clear out real fast once the camel race is over,” he added. He turned to look at the camels — the one in the outer lane, Camelot, had taken to walking around in circles as the other three waited obediently at the starting line. After a couple of loops, Camelot assumed the correct position — and without much warning, the Cameltonian began. Hump Day seemed to take an early lead on the inside lane. But Camelot, in the outer lane, must have used the surprise start to his advantage; he and his rider sped past in the outer lane, and after another blink-and-you-missed-it distance on the track’s opening stretch, the camels, too, were finished racing. They slowed to a lumbering walk, and the four handlers led their charges through the winner’s circle, drawing louder cheers than most of the night’s other races. Camelot’s winning rider grabbed its reins and led it back out into the track, kissing his steed on the nose before heading to the stables. Jared T. Miller is a multimedia journalist in New York.